The countdown for the launch of the Juno mission has reached t-Minus 40 minutes and counting. Fueling is complete and topping is ongoing. Ahead are several built in holds prior to launch at 8:34 AM Phoenix time (1534 UTC). The weather at Cape Canaveral is perfect. The countdown has reached T-Minus 35 minutes and counting. With regard to the Juno spacecraft, it will take five years to reach Jupiter and spend one year doing science exploration. Countdown is at T-Minus 25 minutes. All systems are good. Weather is excellent. T-Minus 20 minutes and counting. Launch in 30 minutes. T-minus 15 minutes. The weather update from the 45th Space Wing is expected in several minutes. Systems continue to get checked off. No issues are being worked at the current time. Booster purge pressure dropped momentarily but is above its lower limit. Weather is good. Some high cirrus clouds off shore, but no change from earlier. No shower activity expected. T-Minus 5 minutes. Centaur O2 level and H2 level are at flight level. The built in hold at T-Minus 4 minutes and holding for 10 minutes. All participants are switching to communications on launch channel one. Issue. “Stand by a moment”. Higher rate of charge cycles on the Centaur helium system. Holding off taking spacecraft power to internal. Discussion of the anomaly on channel six. The launch will not occur at 8:34 AM as scheduled. An additional five (5) minutes is being added to the hold. The launch window opens at 1534 UTC and ends at 1643 UTC (8:34 to 9:43 Phoenix time). A comparison is being made between the current helium cycling on the Centaur, with the cycling observed during the practice full fueling countdown. It looks like a total of ten (10) minutes have been added to the hold. We still have almost an hour left in the launch window. An additional set of tests has been ordered, and an additional ten (10) minutes have been added to the hold. Earliest launch time is estimated to be 8:54 AM Phoenix (1554 UTC). On the previous issue of the booster purge pressure drop, the measurement was in the backup system and the primary remained within normal bounds. Also, the anomaly team has determined the helium charge cycles are within bounds. The leak is with the ground equipment, not with the Centaur helium system. Range Safety is working to remove a boat that has wandered into the launch area. A new Launch time of 16:13 Zulu has been set. The only hangup is waiting for Range Safety to clear the area. NASA engineering is continuing to discuss the situation, but is not prepared to release the hold at 9:09 AM Phoenix time for the now scheduled 9:13 (1613 UTC) launch. And now we have a request to extend the hold by five minutes. The new launch time would be 9:18 (1618 UTC). Engineering has now released the booster for flight. T-minus 4 minutes and holding. The Range Safety folks have cleared the boat from the launch area. A new launch time of 1625 UTC (9:25 AM Phoenix time) has been set. That leaves 18 minutes in the launch window, which expires at 1643 UTC. Final polling of system teams is ongoing, with ten minutes until launch. And now, Centaur on internal power. Spacecraft on internal power. T-minus 3 minutes 59 seconds and counting. Five minutes into flight. All systems look good. MECO, stage separation. 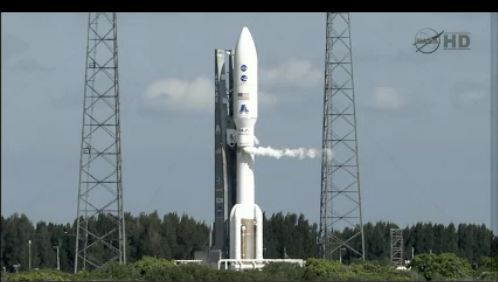 Centaur has started a six minute 12 second burn. Centaur first burn complete. There is a 30 minute coast before the second burn. This entry was posted in Jet Propulsion Laboratory, Jupiter, Robotic Exploration, Solar System, Space Exploration and tagged Atlas V 551, Atmosphere, Aurora, Jet Propulsion Laboratory, JPL, Juno, Jupiter, Magnetosphere, NASA. Bookmark the permalink.